POLIFILM PROTECTION manufacture protection films for every paint systems in the market; Polyester, Plastisol and PVDF to name a few. Each and every gloss level is accounted for by engineering our specific levels of adhesive force, tear resistance and weathering properties too. POLIFILM PROTECTION have the most diverse range of films from coated, none coated and our highly innovative adhesive free Heat Lamination Film. All our films guarantee reliable surface protection during roll forming, bending, sawing and heavy vacuum lifting. Our UV stabilised films guarantee easy removal and outdoor utilisation for up to 12 months. 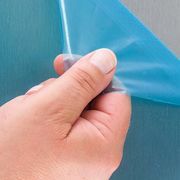 POLIFILM PROTECTION are present in each and every industry including Sandwich Panels, ACP for construction and signage and painted aluminium profiles to name a few. Anti-Fingerprint hydrophobic surface finishes as used in domestic appliances are typical applications for this type of film. Standard applications traditionally utilise Transparent or Black and White films which are often custom printed to meet our individual customer’s requirements. 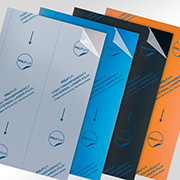 Efficiency and sustainability are fundamental characteristics of POLIFILM PROTECTION products. Cutting edge High Strength films reduce material content by more than 50% and special surface treated films can prevent coil collapse reducing the risk of damage. POLIFILM PROTECTION’S water based adhesive systems are also very environmentally friendly whilst our coextruded range allow simple and easy recycling. Optimised removal properties! Extremely fast, extremely safe, absolutely residue-free. The high-performance protection for Aluminium Composite Panels, Sandwich Panels and special coatings in Household Appliance Industry. The Innovation. Highly transparent laser protection film. PF34C. First highly transparent protective film suitable for fibre lasers. Ideal for processing coated & painted sheets. Combines excellent protective properties with the benefit of unrestricted visual inspection throughout the entire production process. DownloadPre-Painted Metal Protection Films. Highly effective surface protection throughout processing. DownloadEasy-Peel Protection Films. Process optimized removal properties. Designed for quick, clean and easy removal in every application.